We have been advised that there will be a railway crossing upgrade on Riccarton Road from 10pm Friday 9 November to 6am Monday 12 November. Contractors will start setting up this site from 8pm this Friday night and expect to be packed up by 7am on the Monday morning. Riccarton Road will be closed at the railway crossing located between Harakeke Street and Mona Vale Avenue. Traffic (including pedestrians) will be detoured around this road closure. 24 hour work is required to finish this job as quickly as possible, unfortunately this means works will be carried out at night over the weekend of 9 November. Businesses on Riccarton Road will remain accessible from either side of the road closure during this time. Otakaro is celebrating the completion of the City Promenade on Sun 25 November. 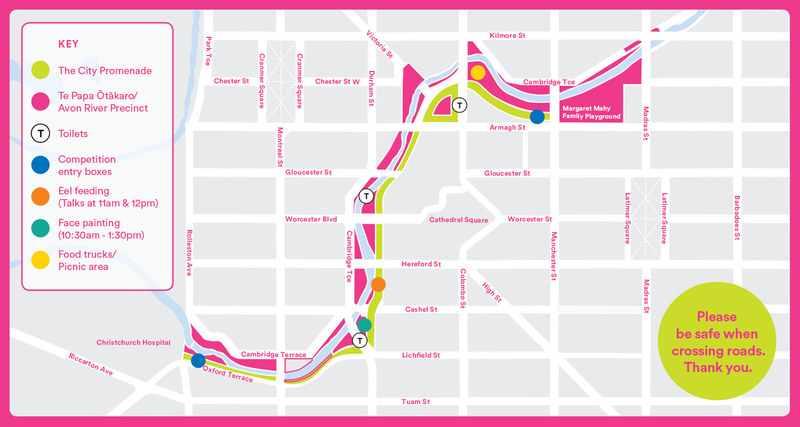 Walk, bike or trike the City Promenade anytime between 10am and 4pm. Hunt out the answers to 10 simple questions, and go in the draw to win $10,000 worth of prizes, including a $5,000 Discover Travel voucher! Along the new riverside walkway you’ll find entertainment, eel feeding, free face painting, food and drink and spot prizes. The official opening will be held outside the Pegasus Arms in Te Papa Hauora Health Precinct at 10am. There will be a railway crossing upgrade on Riccarton Road from 10pm Friday 9 November to 6am Monday 12 November. Contractors will start setting up this site from 8pm that Friday night and expect to be packed up by 7am the following Monday morning. Riccarton Road will be closed at the railway crossing located between Harakeke Street and Monavale Avenue. 24 hour work is required to finish this job as quickly as possible, which means works will be carried out over the weekend of 9 November. Traffic (including pedestrians) will be detoured around the road closure, but businesses on Riccarton Road will remain accessible from either side of the road closure during this time. Abstract: Dr Dewi Fortuna Anwar has researched and written widely on Indonesian foreign policy, ASEAN, the Indo-Pacific concept (from an Indonesian perspective) and Indonesian politics. In her talk she will focus on the Indo-Pacific concept and the current state of play with Indonesia and ASEAN. Speaker bio: Dr Dewi Fortuna Anwar is the Sir Howard Kippenberger Visiting Professor in Strategic Studies for 2018. She is a Research Professor at the Indonesian Institute of Sciences (LIPI) and was the Deputy Chairman for Social Sciences and Humanities from 2001–10. She was Deputy Secretary for Political Affairs from 2010-2015 and from 2015 to 2017 as Deputy for Government Policy Support to the Vice President of the Republic of Indonesia. She is also the Chair of the Institute for Democracy and Human Rights at the Habibie Center, and a member of the Board of Advisors, the Institute for Peace and Democracy, the Bali Democracy Forum. Anwar was a member of the UN Secretary General’s Advisory Board on Disarmament Matters (2008–12), a member of the Weapons of Mass Destruction Commission (WMDC), based in Stockholm, and a member of the International Advisory Board of the Asia-Pacific College of Diplomacy, ANU, Australia. Christchurch’s Festival of Transitional Architecture (FESTA) kicks off on Friday, bringing more than 50 events to the city centre. FESTA is a local event bringing together architectural installations and eating experiences. Headline Event: FEASTA!, 5–11pm, Sat 20 Oct: Mollett Street, FREE, Live for one night only. Free and open to all, FEASTA! will fire up your appetites and imaginations with family activities, music, performance, art, imaginative installations, markets, bars, pop-up restaurants and lots of great things to eat and drink. Rain date Sunday 21 October. For more information, visit here. Waste to Taste: Repurposed Free Food, 9am–4pm, Fri 19 Oct: How can surplus, waste and empty space become a source of free food? Kairos Free Store redistributes surplus food from cafes and eateries to those who need it. When you combine hungry people in the community, quality food that is otherwise wasted and passionate people who want to make a difference – something beautiful is bound to happen. Biking Bee Adventure, 10am–1pm, Sun 21 Oct: On Sunday, Ōtākaro Orchard is running a Biking Bee Adventure, exploring various food production locations in the city. Starting 10am at The Commons on Kilmore St, the tour aims to showcase the importance of pollinators, including bees, to our ecosystem, and help create pollinator-safe infrastructure. The trip ends at New Brighton Community Gardens, on Shaw Ave. Closing night event: From Seed to Palate, 6–10pm, Mon 22 Oct: The festival will close with the screening of SEED: The Untold Story, a film about where food comes from and how food production is changing. In association with the Food Resilience Network, Southern Seed Exchange, the film will screen on the Ilex Cafe lawn, in the Christchurch Botanic Gardens, at 8.30pm on Monday October 22. For the little ones, Wall-E will screen at 6.15pm. The Student First Programme is helping prepare UC for the future, and putting students at the heart of our business. It’s focused on transforming the student administration experience so that UC can continue to deliver world-class education. Since 2017 the Student First Programme has been focused on making our enrolment process simple, fast and certain. This video takes you through the online enrolment process on myUC from a student perspective. You can change the speed by using the gear icon on the toolbar. Students have told us the new enrolment process is user-friendly, intuitive and fast. In a first for UC, students can use social logins to apply and from any device. myUC was first released in November 2017 and since then we’ve continued to improve it, with more than 10 versions or enhancements deployed. The system has performed well over the 2019 enrolment period, processing over 200 applications per day and gaining positive feedback from students, with reports from some getting their enrolment offer within half an hour. We’ve also built a version of this platform called connectUC, for international agents. In 2019 we are turning our focus to development of a staff portal, ourUC, with the Contact Centre starting to use an early version. If you have questions about the Student First Programme, ask your manager or SMT member. 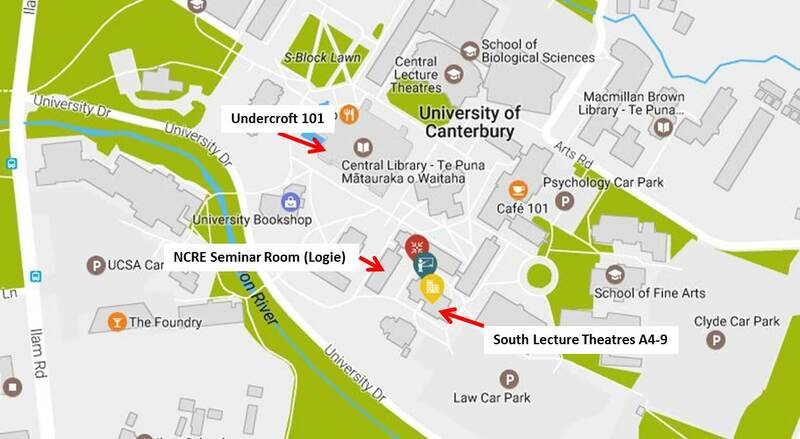 You can also contact the team directly at studentfirstprogramme@canterbury.ac.nz. UC returned to the newly reopened Christchurch Town Hall this week for the first time since the 2010/11 earthquakes, to celebrate the graduation of 1109 graduands over three ceremonies. The University of Canterbury’s Canterbury Distinguished Professor Roy Kerr is to become a Fellow of the Royal Society (UK), for his exceptional contributions to science, placing him among the world’s most eminent scientists. A century ago, two New Zealand-Chinese, University of Canterbury engineering brothers, turned ANZAC soldiers, left their ground-breaking legacy for generations to come. First Nations’ Futures Programme Scholarships Open Now! cid15 on Need a UC template for a presentation or document? Eleri Nugent on Need a UC template for a presentation or document?